Paint as you like and live happy! Dancing with the un-known, exploring inner and outer worlds, laughing and playing, learning to deal with self-doubt and the frustrations of the creative process...expressing yourself and discovering your unique voice...it's challenging, and it's oh so fun! *April 26-28: Sedona, AZ Contemporary Mixed Media in SEDONA! For information and to register go here: Sedona Art Center Waiting List! * May 6-10 Pensacola, FL, Painting with a New Attitude, Contact Diane or Pat to register. Waiting List. * August 5-8- Crooked Tree Arts Center, Petroskey, Michigan, Contemporary Approaches to Self Expression, GO HERE for more information or contact Megan. Waiting List! * Sept 23-26, Dillman's Resort, Lac du Flambeau, WI, Intuitive Mixed Media Painting, call 715-588-3143 to inquire. * October 21-25 SoMMA, Jacksonville, FL, CONTEMPORARY MIXED MEDIA WORKSHOP”.. For more info go here: SoMMA. Waiting List! To get on the list contact Francesca. * November 11-15, Pacific Northwest Art School, Intuitive Acrylic Painting, Whidbey Island, WA, Email or call 360-678-3396 to inquire. *December 12-15, New Braunfels Art League, contact Sandy to enroll. January 13-17, Join me in the desert! 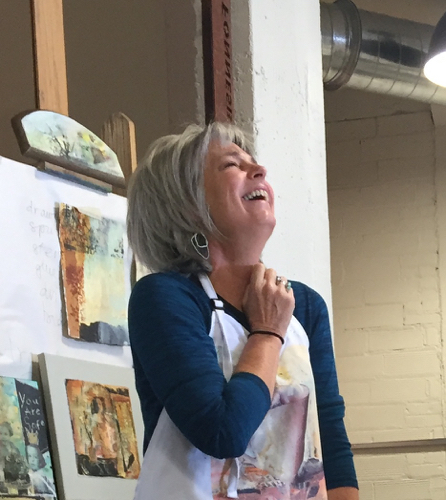 Intuitive Painting with Acrylics, MISA workshop in Tucson, AZ. For details CLICK HERE. Or email MISA. March 16-19, Intuitive Painting with Acrylics, Dallas, TX Contact Sharon for more information. For information about the class go HERE. April 1-5, It's always fun in Calgary! Intuitive Painting, Leading Edge Workshops, Calgary, CA Contact Louise for info. June 1-5, The Studio School, Roanoke, VA contact Jane for information. September 18-20: Regina, Saskatchewan, Canada, Art Gallery of Regina. For information click on this website. October 5-9: Intuitive Acrylic Painting at Cheap Joe's in Boone, NC. A blast to paint with abundant supplies discounted! Email Edwina to register. For information CLICK HERE! Behold the wildly innovative, smokin' hot students! I have been to a lot of art workshops over the past five years. This one was the best. Joan is very bright, likeable, knowledgeable, surprisingly funny, encouraging and a fine artist. She is flexible enough to present an approach and then be supportive if you end up going in quite a different direction. Her demonstrations - with ongoing commentary as she works - are as good as they get. Thank you for the huge role you played in my wonderful and creative Kanuga experience. When I describe it to friends, they tell me that I light up! You helped me breakdown barriers that had held me staring at blank paper for months. All I have to do now is grab my bubble gum cig, my bottled beverage, a piece of charcoal, some drippy paint - and before you know it, I have an under-painting (pants) and inspiration for moving forward! Your approach also helped bring our class together as community of sharing and inspiring artists. So thanks to all of my fellow classmate artists too. I loved meeting everyone and hope you are all holding on to the energy we created together at Kanuga. Just wanted to tell you that I found last week's workshop most helpful-- in terms of both technique and motivation. Many thanks for your professional and inspirational approach to painting and your obvious interest in helping others to gain greater skill and creativity. I want you to know how inspired I was by your class, and feel that my work has changed dramatically just in these last few weeks. I now have a way to start my pieces, using your Miss Bossy Pants techniques, and it has made a profound difference. I am gradually making it my own, finding what order and techniques I seem to resonate to, and feel so much freer and confident that something will emerge that I can work with. Weeks prior to your class, I had just decided to take a self imposed sabbatical for at least a year freeing myself from being so focused on selling my work and painting what the world seemed to want. I needed to return to creating from that inspired place which allows for whatever wants and needs to come forth freely and openly without limitations. Your class was a perfect way to kick off this time of exploration and experimentation. The timing of this class was in perfect alignment for me, and you were the perfect teacher. Thank you so much. I look forward to attending another workshop with you down the road.